An article focused on the structure validation reports produced by wwPDB is now available: Validation of Structures in the Protein Data Bank (2017) Structure 25: 1317-1318 doi: 10.1016/j.str.2017.10.009. The paper describes how validation reports for PDB structures determined by X-ray crystallography were first made available to depositors in 2013 and added to the PDB archive in 2014. In early 2016, following the update of the OneDep system, reports for structures solved by nuclear magnetic resonance and 3D electron microscopy were made available to the depositors and later incorporated into the PDB archive. These reports are based on the published recommendations of expert Validation Task Forces appointed by the wwPDB and EMDataBank partners. Preliminary reports are generated at a stand-alone webserver (validate.wwpdb.org), during deposition in OneDep (deposit.wwpdb.org) or programmatically via a web service API. The wwPDB partners strongly recommend the use of these options to verify structure quality prior to data submission to the PDB archive. Following biocuration, an official wwPDB structure validation report is produced, which should be submitted to journals along with manuscripts describing the structure. Upon public release of a PDB entry, the corresponding validation report is also made public in the PDB archive. A new FTP repository, ftp://ftp-versioned.wwpdb.org/ now hosts versioned structural model files in PDBx/mmCIF and PDBML formats. As announced on May 17, 2017, wwPDB has introduced a versioning system to enable depositor-initiated or wwPDB-initiated updates to previously released PDB entries while retaining the same PDB accession code. Updates to atomic coordinates, polymer sequence or chemical description in a PDB coordinate file will trigger a major version increment. Other changes will be classified as minor. All major versions of each PDB structure are retained in the new FTP archive. In the 2018 phase of the project, wwPDB will enable depositor-initiated updates of coordinates. where xyz stands for coordinate content; cif indicates the file format; and gz indicates a compressed UNIX archive file. Different views of the repository are provided for content type and format as a convenience for repository users. The wwPDB provides a link to the absolutely latest version files as well as latest version of each major version in the entries directories. For example, users can access the absolute latest version of each coordinate mmCIF file (e.g. 1ABC) via below file path. Or users can access all major versions of coordinate mmCIF files for entry 1ABC via below file path. Data files in the current archive location ftp://ftp.wwpdb.org/pub/pdb/data/structures/ will continue to use the familiar naming style and will continue to contain only the latest version for every entry. The wwPDB Foundation raises funds from Individual and Corporate sponsors in support of the outreach activities of the wwPDB crucial to the future of the PDB archive, including workshops, symposia, and advisory meetings. Corporate sponsors are acknowledged on the Foundation website, with opportunities to post job listings and use the Foundation logo on marketing materials. Individual sponsors ($100 or more for professionals, $25 or more for students) are acknowledged online and with a special gift. To support the wwPDB Foundation in 2017, please contact Christine Zardecki or donate online via PayPal (no account needed). 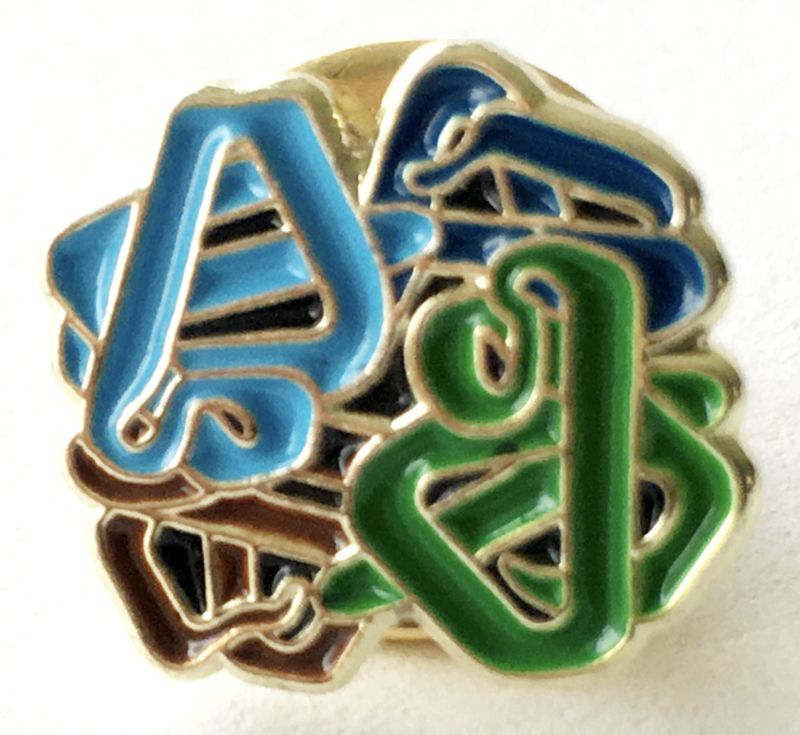 Individual sponsors will receive this hemoglobin lapel pin. wwPDB and the wwPDB Integrative/Hybrid (I/H) Methods Task Force announce the public release of a prototype system for depositing I/H structural models, PDB-Development (or “PDB-Dev”) at pdb-dev.wwpdb.org. Structural characterization of complex macromolecular assemblies is increasingly being carried out using I/H methods. Traditional structure determination methods such as X-ray crystallography and NMR spectroscopy are generally insufficient for tackling such complex assemblies. Recently, methods have been developed that combine spatial restraints derived from a variety of complementary experimental techniques, including cryo-electron microscopy, small angle scattering, chemical crosslinking, mass spectrometry and other proteomics and bioinformatics tools. PDB-Dev was established to make I/H models available to the broader biological research community. It incorporates recommendations published by the wwPDB I/H Methods Task Force (1). PDB-Dev was built based on a data dictionary that captures the details of I/H models including a variety of experimentally-derived spatial restraints and the modeling of multi-scale, multi-state, time-ordered ensembles. The dictionary is an extension of the PDBx/mmCIF dictionary used by the wwPDB to archive macromolecular structures. Currently, three test cases covering a variety of features of the Integrative Modeling Platform software (IMP, 2) have been deposited to PDB-Dev, including the 7-piece Nup84 sub-complex of the nuclear pore complex from yeast (3), the yeast exosome complex (4), and the yeast mediator complex (5). wwPDB Partnership is committed to encouraging development of methods for archiving and validating I/HM structural data, and has published a policy governing I/HM depositions and the PDB archive. Creation of PDB-Dev and the I/H methods data dictionary were supported by NSF EAGER award number 1519158. Sali, A., Berman, H.M., Schwede, T., Trewhella, J., Kleywegt, G., Burley, S.K., Markley, J., Nakamura, H., Adams, P., Bonvin, A.M., Chiu, W., Peraro, M.D., Di Maio, F., Ferrin, T.E., Grunewald, K., Gutmanas, A., Henderson, R., Hummer, G., Iwasaki, K., Johnson, G., Lawson, C.L., Meiler, J., Marti-Renom, M.A., Montelione, G.T., Nilges, M., Nussinov, R., Patwardhan, A., Rappsilber, J., Read, R.J., Saibil, H., Schroder, G.F., Schwieters, C.D., Seidel, C.A., Svergun, D., Topf, M., Ulrich, E.L., Velankar, S., and Westbrook, J.D., Outcome of the First wwPDB Hybrid/Integrative Methods Task Force Workshop. Structure, 2015. 23(7): p. 1156-67. doi:10.1016/j.str.2015.05.013. Russel, D., Lasker, K., Webb, B., Velazquez-Muriel, J., Tjioe, E., Schneidman-Duhovny, D., Peterson, B., and Sali, A., Putting the pieces together: integrative modeling platform software for structure determination of macromolecular assemblies. PLoS Biol, 2012. 10(1): p. e1001244. doi:10.1371/journal.pbio.1001244. Shi, Y., Fernandez-Martinez, J., Tjioe, E., Pellarin, R., Kim, S.J., Williams, R., Schneidman-Duhovny, D., Sali, A., Rout, M.P., and Chait, B.T., Structural characterization by cross-linking reveals the detailed architecture of a coatomer-related heptameric module from the nuclear pore complex. Mol Cell Proteomics, 2014. 13(11): p. 2927-43. doi:10.1074/mcp.M114.041673. Shi, Y., Pellarin, R., Fridy, P.C., Fernandez-Martinez, J., Thompson, M.K., Li, Y., Wang, Q.J., Sali, A., Rout, M.P., and Chait, B.T., A strategy for dissecting the architectures of native macromolecular assemblies. Nat Methods, 2015. 12(12): p. 1135-8. doi:10.1038/nmeth.3617. Robinson, P.J., Trnka, M.J., Pellarin, R., Greenberg, C.H., Bushnell, D.A., Davis, R., Burlingame, A.L., Sali, A., and Kornberg, R.D., Molecular architecture of the yeast Mediator complex. Elife, 2015. 4. doi:10.7554/eLife.08719. 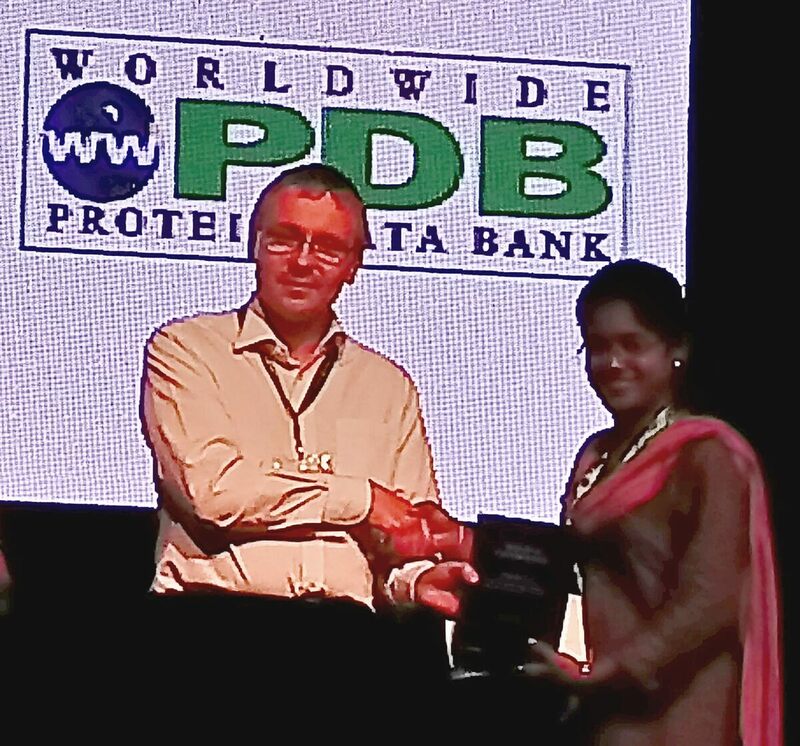 Congratulations to Ms Deekshi Angira, who recently received the wwPDB Poster Prize for Gamma secretase activating protein as profound target for Alzheimer’s disease (Deekshi Angira, Vijay Thiruvenkatam, Indian Institute Of Technology Gandhinagar). As part of the award, Ms Angira received the Methods in Enzymology volume on "The Resolution Revolution: Recent Advances In cryoEM" signed by many of its authors. Ms Deekshi Angira receives the prize from Dr Matthew Conroy, outreach lead at PDBe. Meet wwPDB members from around the globe at the 24th General Assembly and Congress of the International Union of Crystallography (IUCr, August 21-28, 2017) in Hyderabad. 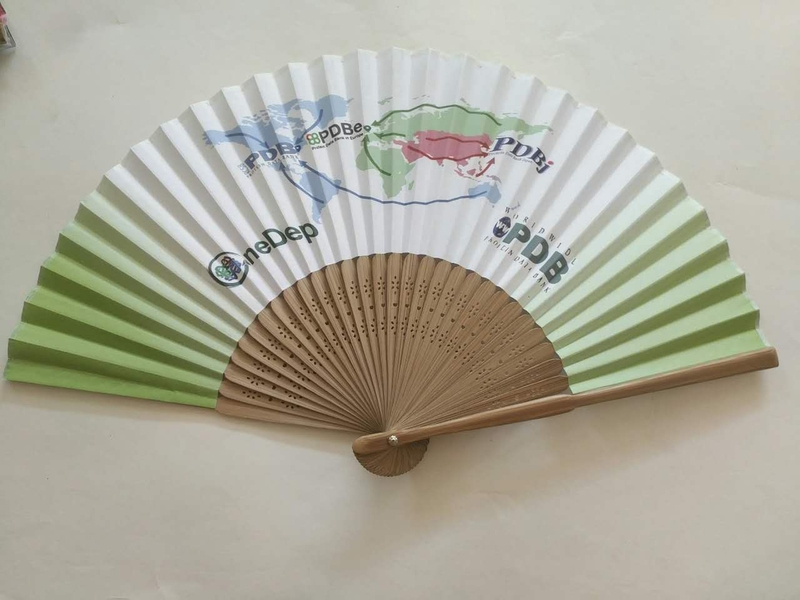 Come to exhibition stand 76 to receive a special fan celebrating the wwPDB OneDep system. The wwPDB is also sponsoring a Poster Prize for students in the “structural biology” category. As announced on May 17, 2017, wwPDB will introduce a file versioning system to retain depositor-initiated updates of previously released coordinate entries. A new FTP repository will host versioned files. Versions will be separated into major and minor updates. Updates to atomic coordinates, polymer sequence or chemical description in a PDB coordinate file will trigger a major version increment. Other changes will be classified as minor. All latest major versions of each PDB structure will be retained in the new FTP archive. Phase 1 (October 2017), we will release the new versioned FTP archive at ftp://ftp-version.wwpdb.org for structural model files in PDBx/mmCIF and PDBML formats. Phase 2 will be released in 2018 and will support depositor-initiated updates of coordinates in PDBx/mmCIF and PDBML formats. The familiar 4 character PDB accession code will be extended to 8 characters and will include the prefix “pdb”. Thus PDB accession code for entry 1abc would become pdb_00001abc. where xyz stands for coordinate content; cif indicates the file format; and gz indicates a zipped UNIX archive file. Different views of the repository will be provided for the most common use cases as a convenience for repository users. For 2017 phase 1, views by content type and format similar to the current repository will be introduced. All latest major versions are included. Data files in the current archive location ftp://ftp.wwpdb.org/pub/pdb/data/structures/ will continue to use the familiar naming style and will contain only the latest version for every entry. The model files in the PDB FTP archive have been updated to V5.0 of the PDBx/mmCIF dictionary. Both mmCIF and XML formats have been updated. These files were provided previously for the community to review and test. There is no change to PDB format files as PDB format is a legacy format. These, therefore, do not contain all of the remediated information. Improved audit categories to capture details of changes to files down to the category level for entry revisions. Better organized data content and much more extensive metadata in model files for electron microscopy derived models. Corrected source organism and sequence references for each sequence fragment in chimeric proteins. The complete list of changes can be found at the wwPDB website. Questions regarding V5.0 data should be sent to deposit-help@mail.wwpdb.org. Download the new brochure that outlines the 5 Easy Steps to PDB Deposition with OneDep. The wwPDB is planning to introduce in 2017 a new procedure for the management by the Depositor of Record (where the Depositor of Record is defined as the Principal Investigator for the entry) of substantial revisions to previously released PDB archival entries. At present, revised atomic coordinates for an existing released PDB entry are assigned a new accession code, and the prior entry is obsoleted. This long-standing wwPDB policy had the unintended consequence of breaking connections with publications and usage of the prior set of atomic coordinates, resulting in a non-trivial barrier to submission of atomic coordinate revisions by our Depositors of Record. The wwPDB is introducing a file versioning system that allows Depositors of Record to update their own previously released entries. Please note, in the first phase, file versioning will be applied to the atomic coordinates refined versus unchanged experimental data. Version numbers of each PDB archive entry will be designated using a #-# identifier. The first digit specifies the major version, and the second designates the minor version. The Structure of Record (i.e., the initial set of released atomic coordinates) is designated as Version 1-0. Thereafter, the major version digit is incremented with each substantial revision of a given entry (e.g., Version 2-0, when the atomic coordinates are replaced for the first time by the Depositor of Record). “Major version changes” are defined as updates to the atomic coordinates, polymer sequence(s), and/or chemical identify of a ligand. All other changes are defined as “minor changes”. When a major change is made, the minor version number is reset to 0 (e.g., 1-0 to 1-1 to 2-0). For the avoidance of doubt, the wwPDB will retain all major versions with the latest minor versions of an entry within the PDB archive. Current wwPDB policies governing the deposition of independently refined structures based on the data generated by a research group or laboratory separate from that of the Depositor of Record remain unchanged. Versioning of atomic coordinates will be strictly limited to substitutions made by the Depositor of Record. The wwPDB is mindful of the importance of continuity in providing services and supporting User activities. For as long as practicable, the wwPDB will continue assigning PDB codes that can be truncated losslessly to the current four-character style. In the same spirit, initial implementation of entry file versioning will appear in a new, parallel branch of the PDB archive FTP tree. More details on the new FTP tree organization and accessibility of version information will be forthcoming. Data files in the current archive location ftp://ftp.wwpdb.org/pub/pdb/data/structures/ will continue to use the familiar naming style and will contain the latest version in the corresponding versioned archive. On July 12, 2017, the wwPDB partners plan to update the PDB FTP archive with PDB structure entry files conforming to V5.0 of the PDBx/mmCIF dictionary, which already supports the global wwPDB system for Deposition, Biocuration, and Validation of PDB data - OneDep. In preparation for this update, to allow the community ample time to test the planned update and to provide feedback, the wwPDB is now delivering PDBx/mmCIF and XML structure entry files for all entries in the PDB archive conforming to the new data standards via a new FTP repository (ftp://ftp-beta.wwpdb.org/). This collection of test files will be updated in concert with regular weekly updates of the PDB archive. Complete lists of changes can be found at the wwPDB website (https://www.wwpdb.org/documentation/remediation). The wwPDB strongly encourages the community to review and test the updated files. We will attempt to address the reported issues incrementally as User feedback is received in advance of the rollout on July 12, 2017. Other derived data and experimental data files of ftp-beta tree will be delivered incrementally to the ftp-beta tree between May 3 and July 12, 2017. The test FTP area (ftp://ftp.wwpdb.org/pub/pdb/test_data/EM/) containing previously updated 3DEM model files (previously made available in December 2016) is to be retired effective May 3 2017. The wwPDB is preparing the update of PDBx/mmCIF model files for all entries in the PDB archive to V5 version of the PDBx/mmCIF dictionary. When completed, all PDB model files will have better organized content and will conform to the revised data model used within the wwPDB OneDep System. A list of changes will be available at the wwPDB website (https://www.wwpdb.org/documentation/remediation). Since January 2016, the OneDep system (https://www.wwpdb.org/deposition/system-information) has supported Deposition, Biocuration, and Validation of structures determined by experimental methods currently accepted by the PDB. The updated model files for all experimental methods will be made available in a new PDB FTP server (ftp://ftp-beta.wwpdb.org/pub/pdb/data/structures/), and the corresponding PDBx/mmCIF dictionary will be released in May 2017. The test FTP area (ftp://ftp.wwpdb.org/pub/pdb/test_data/EM/) containing previously updated 3DEM model files (previously made available in December 2016) will be simultaneously retired. The current PDB FTP archive will be updated with new files corresponding to the V5 PDBx/mmCIF dictionary in July 2017. Users are strongly encouraged to review and test the updated data files. The wwPDB partners are pleased to announce that updated validation reports for all X-ray, NMR, and 3DEM structures deposited in the PDB archive are now available on March 15, 2017. The updates include new percentile statistics reflecting the state of the PDB archive on December 31th 2016 and updated versions of the Mogul software (2017) and CSD archive (as538be). These updated wwPDB validation reports provide an assessment of structure quality using widely accepted standards and criteria, recommended by community experts serving in the Validation Task Force. The wwPDB partners strongly encourage journal editors and referees to request them from authors as part of the manuscript submission and review process. The reports are date-stamped and display the wwPDB logo, and contain the same information, regardless of which wwPDB site processed the entry. Provision of wwPDB validation reports is already required by Nature, eLife, The Journal of Biological Chemistry, the International Union of Crystallography (IUCr) journals, FEBS journals, Journal of Immunology and Angew Chem Int Ed Engl as part of their manuscript-submission process. Validation reports are also provided to depositors through OneDep - the wwPDB portal for validation, deposition and biocuration of structure data. The wwPDB partners encourage the use of the stand-alone validation server and the webservice API at any time prior to data deposition. Depositors are required to review and accept the reports as part of the data submission process. Validation reports will continue to be developed and improved as we receive recommendations from the expert Validation Task Forces (VTF) for X-ray, NMR, EM, and on ligand validation, and as we collect feedback from depositors and users. Further information and sample validation reports are available. The paper describing wwPDB OneDep system is now available. The wwPDB has deployed a unified system for deposition, biocuration, and validation of macromolecular structures globally across all wwPDB, EMDB, and BMRB deposition sites to meet the evolving requirements of the scientific community to archive structural data over the coming decades. The OneDep system provides a user-friendly deposition interface and improved structure validation with the benefit of recommendations from expert task forces representing the respective methodological communities. The processing efficiency in biocuration is improved as OneDep supports a more automated workflow. As Milka Kostic, the Senior Editor at Structure and Cell Chemical Biology described, OneDep is a step in the right direction and offers a single point of entry into the atomic coordinate deposition process, as well as improving processes of structure validation and data biocuration. A snapshot of the PDB archive (ftp://ftp.wwpdb.org) as of January 1, 2017 has been added to ftp://snapshots.wwpdb.org/. Snapshots have been archived annually since January 2005 to provide readily identifiable data sets for research on the PDB archive. The directory 20170101 includes the 125,463 experimentally-determined coordinate files and related experimental data available at that time. Coordinate data are available in PDBx/mmCIF, PDB, and XML file formats. The date and time stamp of each file indicates the last time the file was modified. The snapshot is 757 GB.